Microsoft has announced a new version of ActiveSync to add support for the Smartphone and other minor fixes. 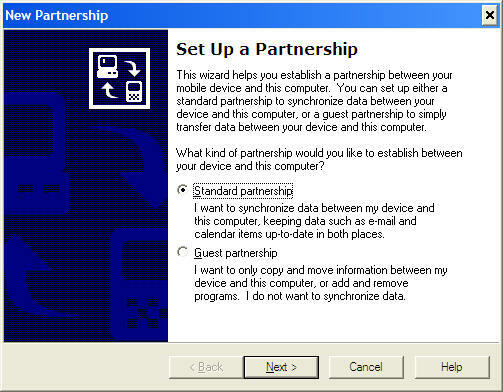 It also offers the ability to configure the synchronization settings prior to your first synchronization. Microsoft has dropped support for Windows 95, Schedule + and Outlook 97 with this release so you'll need Windows 98, ME, NT, 2000 or XP. 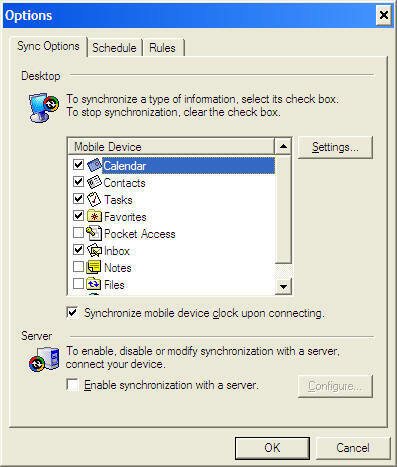 If you have Windows 95 or Schedule + you can still use ActiveSync 3.1. In addition, you can now synchronize Favorites and Notes (right into Outlook) as well as other files like Pocket Access, Inbox, Calendar, Contacts, Tasks and AvantGo. 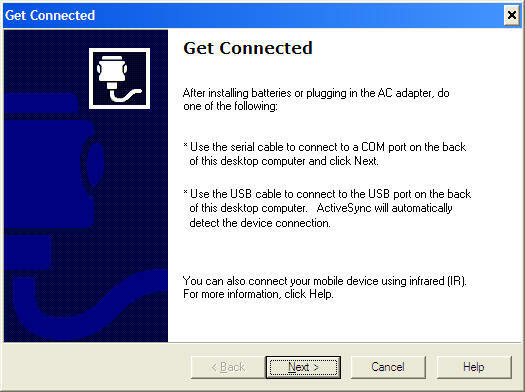 ActiveSync 3.6 supports all Windows CE 2.1 and later PC Companions. With this release, Microsoft has dropped support for Windows CE 2.0 Handheld PC and Pocket PCs. 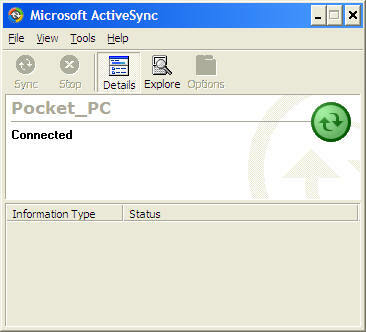 Also, if you rename your Pocket PC, ActiveSync 3.6 will just change the name on your desktop and sync. 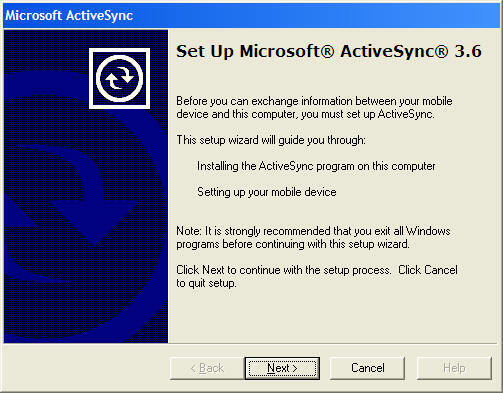 You can download ActiveSync 3.6 from Microsoft's website. 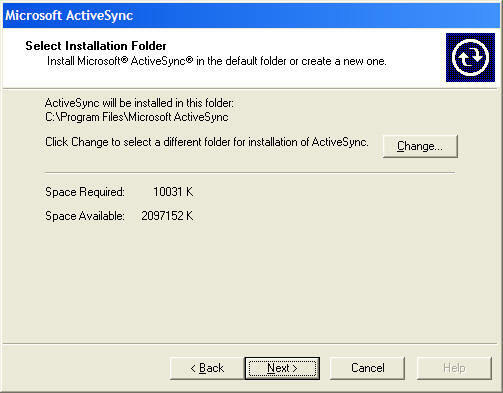 There you will find the latest version of ActiveSync 3.6, build 12007. 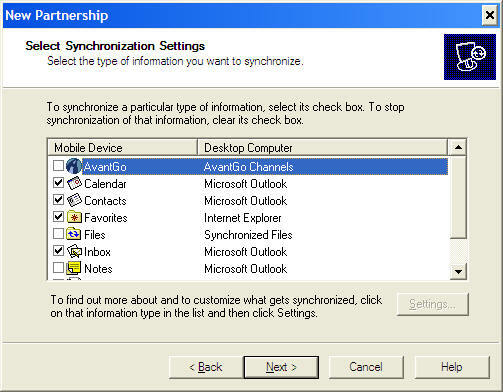 If you have installed the latest version of AvantGo, you must reinstall it after installing ActiveSync 3.6 to sync. Note: Also, you can install over existing versions of ActiveSync 3.x. 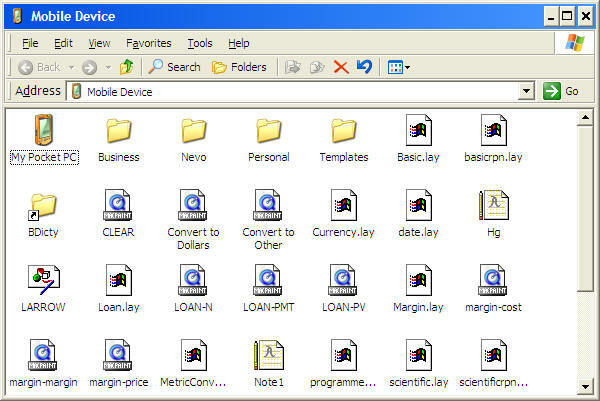 I have personally installed ActiveSync 3.6 on Windows 98SE and Windows XP. 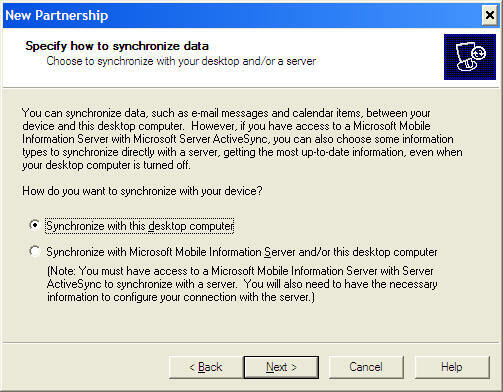 ActiveSync 3.6 now installs their own PPP server for synchronization. It offers advanced capabilities like auto-detection of the serial port your PC Companion is installed on. It also automatically adjusts the baud rate of the connection based on the settings of your PC Companion (Control Panel - Communications - PC Connection - Change Connection) You can now select 115.2K baud and it will connect without any other changes required on the desktop! 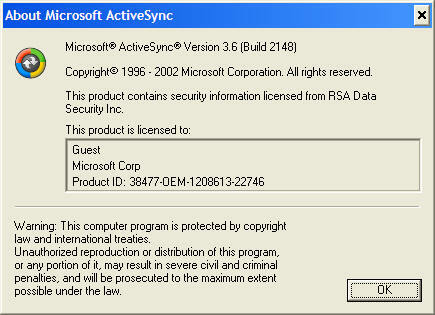 If ActiveSync 3.6 runs into a problem completing synchronization, it will notify you in the status window. You have the option to see the log to identify the problem and potential options to resolve it. 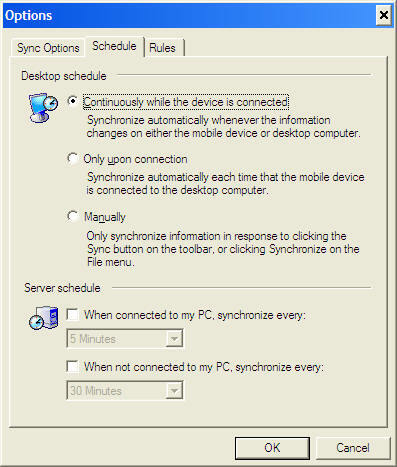 ActiveSync 3.6 offers the same sync options that ActiveSync 3.5 did. The Calendar defaults to synchronizing two weeks of appointments in the past while the Contacts defaults to synchronizing all contacts and only outstanding tasks. 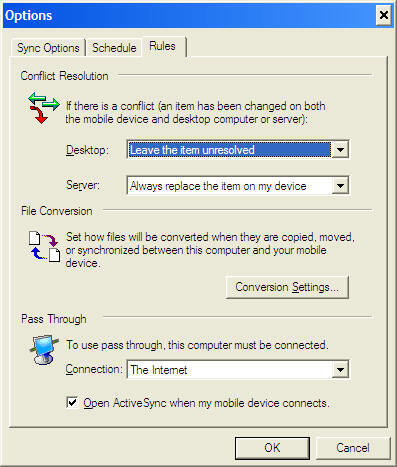 File synchronization is not on by default, however, I recommend that all users turn this feature on since it automatically copies and converts documents stored in your \My Documents\Synchronized Files\ folder to your desktop. 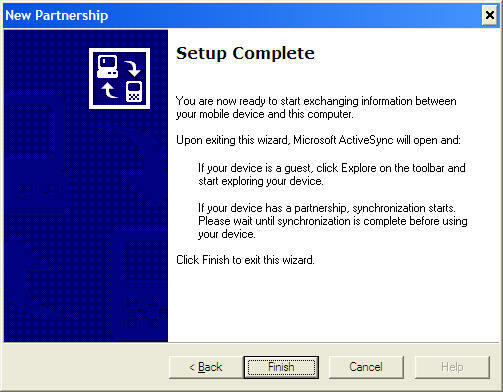 Overall, Microsoft has made synchronization of Windows CE PC Companions very easy with ActiveSync 3.6. It addresses problems with USB which most Pocket PC and Handheld PC 2000 users are using. Also, the ease of upgrading an existing installation makes upgrades easy.